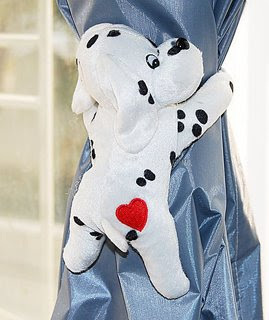 A good idea for decoration your children's room are curtain holders in form of toy figures. Cute animals clasp the curtain in their paws. It's so lovely! You can choose colors and species of animals to suit your room and tastes of you and your children. Be sure to choose the favorite animals of your kids, otherwise your ingenuous creative idea may be spurned. What is worse that giving a cat to a dog lover or vice versa? If you make the proper choice, the toy animals will undoubtedly be loved by your child and become their best friends. In the day the toys will hold the curtains, and in the night they can be hugged by the sleeping child. Well, at least if you wash them regularly to avoid dust buildup :) Good luck!